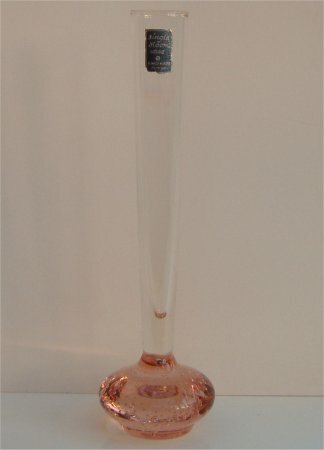 This pinky/peach vase is approximately 208mm (8 & 3/16ths inches) tall. 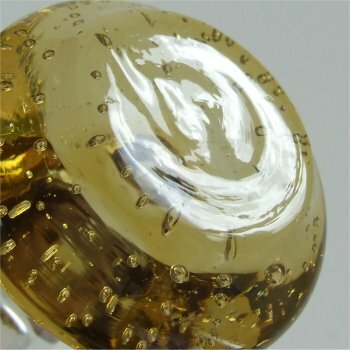 The stem is clear and has a medium flare being approximately 28mm (1 & 1/8th inches) across. 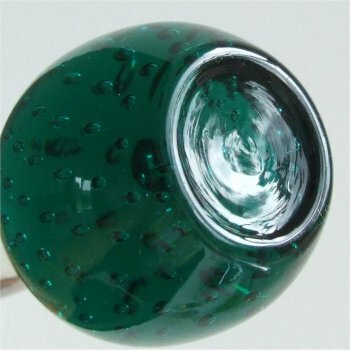 The base is a squat ball shape and has small controlled bubbles coming up from the base in a spiral. The bottom of the base has an small inner circle which is raised and a slightly creased finish. 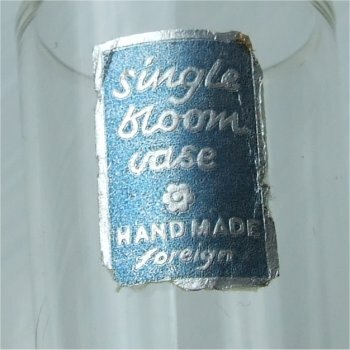 The paper label is oblong (portrait) and is a metallic blue colour with a silver border and wording which states 'single bloom vase HAND MADE foreign'. There is also a logo of a stylised flower (see images below). 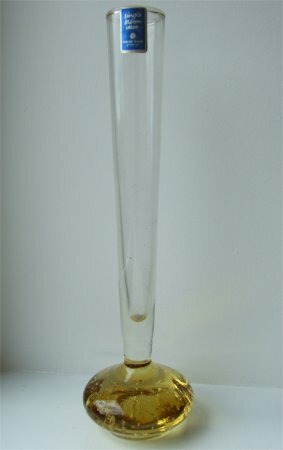 Below is an identical vase of the same height and diameter but with a yellow/amber base. The label is the same size and colour but the wording uses a slightly different font size. 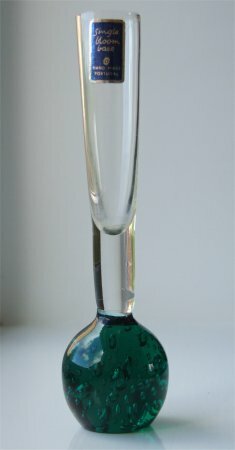 This green vase is approximately 155mm (6 & 1/8th inches) tall. 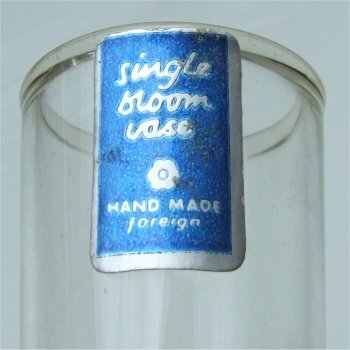 The stem is clear and has a medium flare being 25mm (1 inch) across. 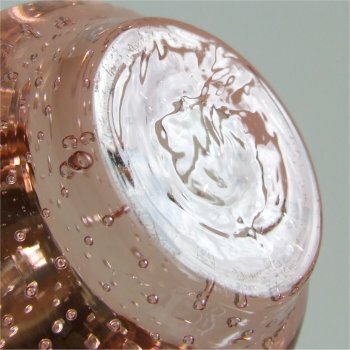 The base has small to tiny controlled bubbles coming up from the base in a spiral.The bottom of the base is concave with a feint small ring in the middle. 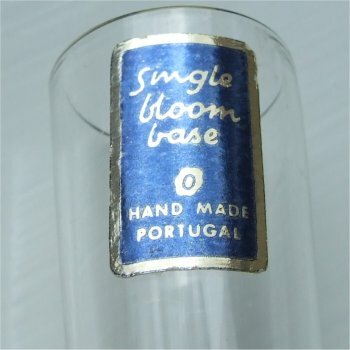 The paper label is oblong (portrait) and is a metallic blue colour with a gold border and wording which states 'single bloom vase HAND MADE PORTUGAL'. There is also a logo of a stylised flower (see images below). Noticeably the base is quite different from the previous ones, so this does not necessarily mean that the others were also made in Portugal. 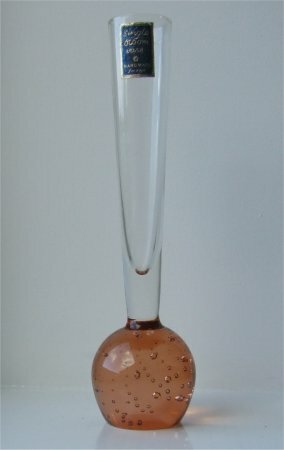 This peach vase is approximately 158mm (6 & 1/4 inches) tall. 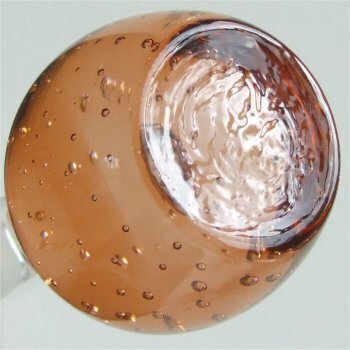 The stem is clear and has a medium flare being 25mm (1 inch) across. The base has small controlled bubbles coming up from the base in a spiral. The bottom of the base is flat but with a raised ridge around the edge. It has a creased finish. 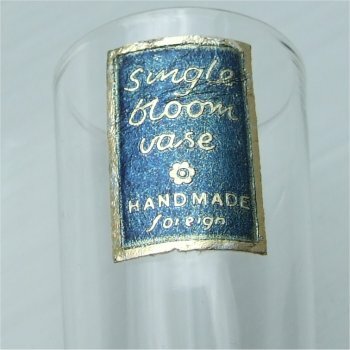 The paper label is oblong (portrait) and is a metallic blue colour with a gold border and wording which states 'single bloom vase HAND MADE foreign'. There is also a logo of a stylised flower (see images below).